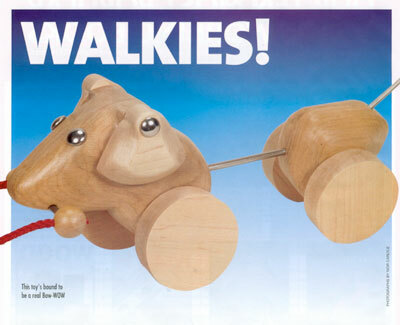 This dog not only wobbles comically when pulled along but, with the aid of the loop of cord attached to its tow bar, can be made puppet-like to shake its head vigorously, an action which makes its ears flap. This project is constructed from American oak and maple obtained from a wood yard as offcuts. 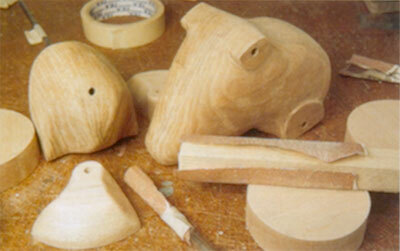 They looked good in combination and consequently the original intention of using beech was changed. 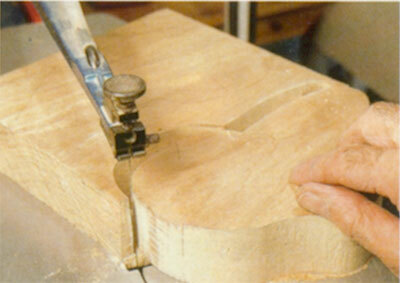 However, if you have any suitable hardwood offcuts that could prove as attractive, do use those. I used commercially available hardwood balls and cut out the wheels on my scrollsaw, but woodturners could make these on a lathe with possibly more elaborate profiles. Similarly I used metal spring caps on the ears and for the eyes to give the toy a high-tech appearance. These too could have hardwood turnings in their place if you prefer a more traditional approach. A steel sink and drain cleaner was used for making the tail, this being far stronger, therefore safer. I bought mine for 99 pence and have plenty left over for other projects. Use of a 6.5mm drill bit for my axle holes enabled the 6mm steel rod to rotate freely. 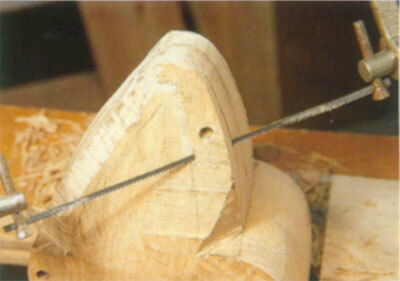 However I recommend drilling test holes into some scrap and testing with the rod as these can vary. All gluing is with PVA adhesive except where indicated. 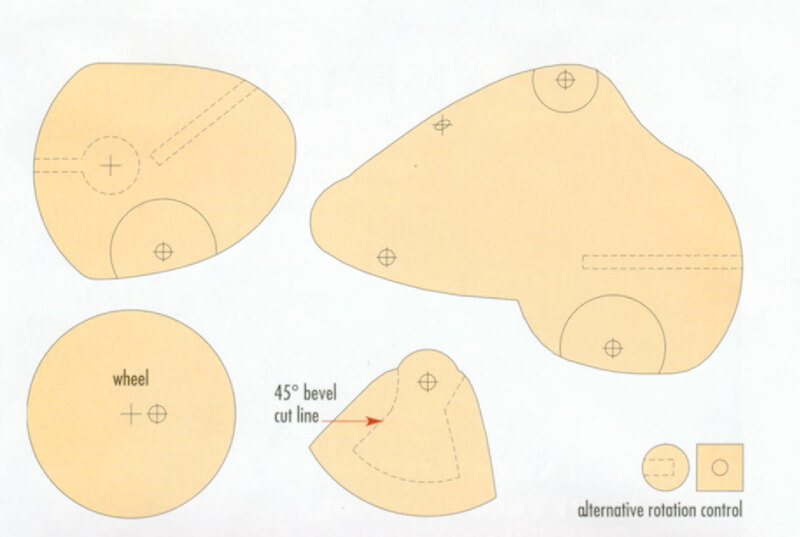 Make card templates of the head and tail sections and use these to mark up the shapes and their 6.5mm and 6mm hole centres. Test on a piece of scrap to find a suitable blade - I opted for a 5tpi reverse cut but effects can vary according to make of blade and scrollsaw - then cut out the sections, taking particular care when the blade is advancing along the grain. Bind the two head and tail sections together with masking tape. Unless you have extra-long drills proceed as follows. Drill as far as possible into the sections the 6.5mm holes for the tow bar, ears and wheel axles, but not for the eyes. 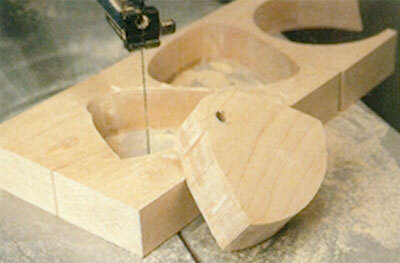 Separate the sections and extend the holes through the sections that were at the bottom when drilling. Glue and clamp the head sections together using dowels in the holes to aid alignment, then join the tail sections together with masking tape while inserting a dowel in the axle hole to aid alignment. Mark up the point of entry for the 6.5mm holes into the head and tail sections for the steel body rod and do the same for the 6mm tail hole. 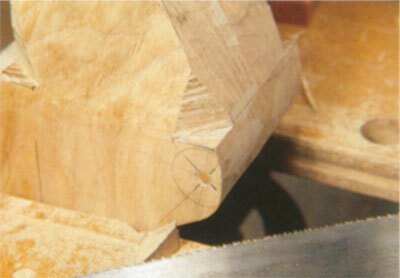 To act as a drilling guide, also mark up the sides with lines showing the direction of the holes. 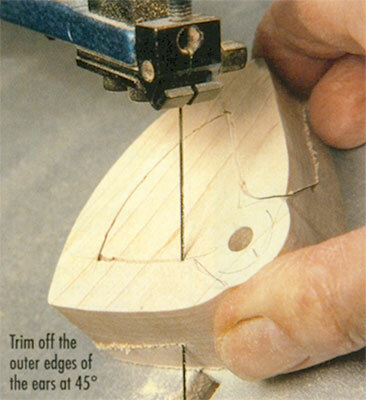 Clamp the sections into a drill vice and use the hole guide lines to aid alignment with a try-square. 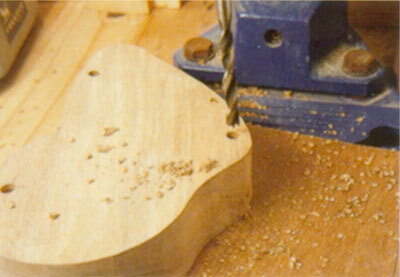 Drill the holes to the required depth. Separate the tail sections. Shape the front sides of the head by slicing off the corners, then level out the sides of the head with a plane or surform. Do not remove the semicircular areas around the ear and wheel axle holes. 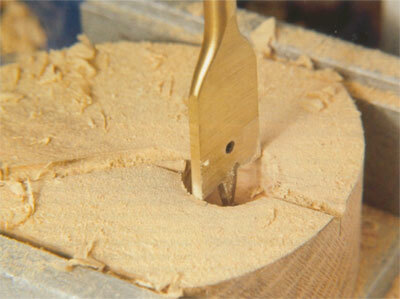 Further trim the edges and around the ear hole with a coping saw, then round off the edges with a rasp. 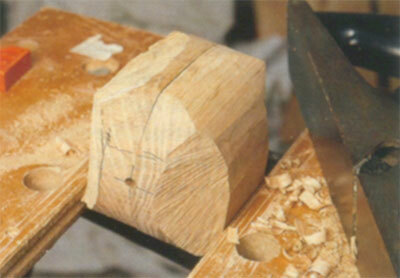 A round surform file is excellent for this job and trimmed the very hard oak with ease. 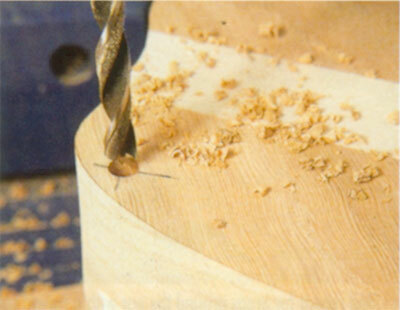 Into each of the tail sections from the inside, drill a 22mm- (7/8in) diameter hole to a depth of 11mm (7/16in). Join the tail sections with a dowel and some tape and saw off the waste areas before rounding off the back with a plane. Trim nothing from the circular areas around the wheel axle holes. On the head and tail sections use a burr in a mini drill to define the detail around the wheel and ear axle exit hole areas. 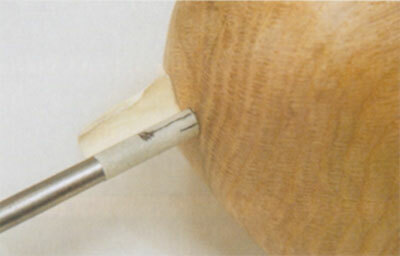 A flexible drill shaft powered by a conventional power drill with various sizes of sanding drums can be used effectively to smooth out the shape. Drill a 6.5mm hole two-thirds of the way in to four 19mm (3/4in) hardwood balls, and at right-angles to the holes in two of these balls drill a hole all the way through. 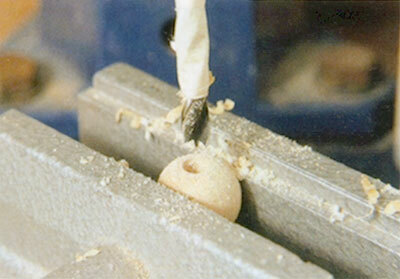 Also drill a 6.5mm hole through another ball to take the rope handle. Cut the body rod to length and roughen the ends of the steel rod with a file to provide a more effective grip for the resin. 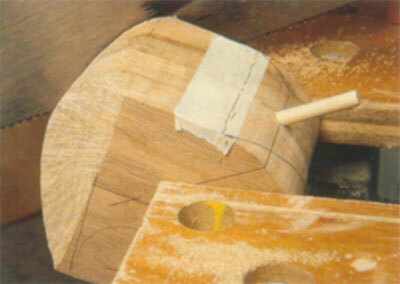 With epoxy resin adhesive such as Araldite fix one end into the hole in one of the wooden balls. 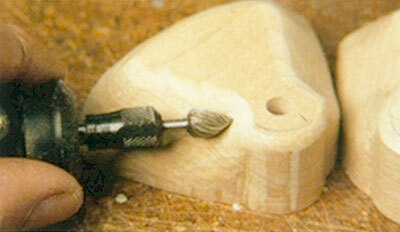 When set, drill a 6.5mm hole into the ball at 90 degrees to the steel rod, and glue in a piece of 1/4in dowel. 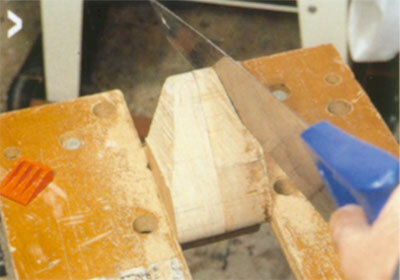 When set, trim the dowel to length to give the required 90 degree movement in the tail section cavity. This is to allow the rear section to swing without becoming inverted. Assemble, test the swing action, and, to ensure correct order on final assembly, mark the section in which the spigot is enclosed. 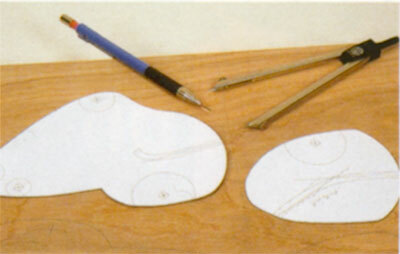 The tail sections may look different from the drawings in the photographs due to a change of plan, in that the hole for the rod is longer than necessary. This is because I made several changes as I progressed with the design of this project. At the beginning I intended to have a flexible body rod but this proved impractical. Using a wooden ball on the end of the body rod seemed an obvious choice at the time, but I think with the benefit of hindsight that a hardwood disc would have made a more elegant solution. 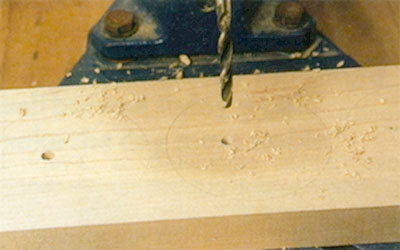 To make this mark up an 18mm- (23/32in) diameter circle onto a piece of 18mm-thick hardwood. 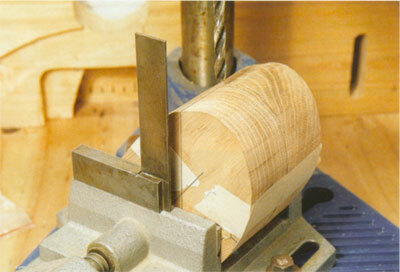 Drill a 6mm hole two-thirds of the way into its edge before cutting out. A swing movement of 45 degree would be more than adequate and certainly don't make it less than 25 degrees. Mine works perfectly well but less swing would make the dog more stable on cornering. 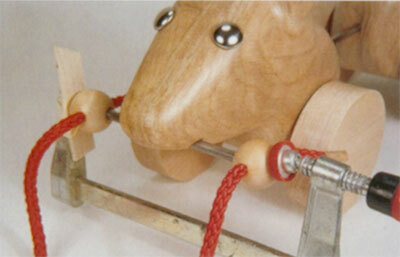 This is because the wheels do not rotate independently and the dog has to be pulled sideways to turn. Mark up the wheels and counterbore the 6.5mm axle holes offset by 10mm (3/8in) from the centres before cutting out. 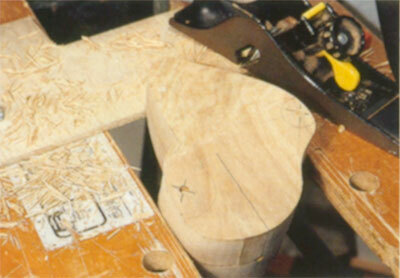 Also mark up the ears and drill 6.5mm holes all the way through before cutting them out. 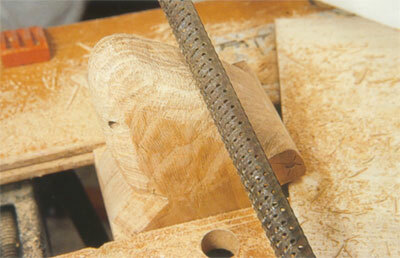 At 45 degree bevel cut the outer edges of each ear, noting that right- and left-hand versions are required, then sculpt to shape with burrs and a sanding drum in a mini drill. Coat the wooden ball, or the alternative rotation control disc on the steel body rod, with candle wax, along with the area of the rod that will be inside the tail section. Check that the tail section partially rotates as required before gluing the two tail sections together with the rod inside. 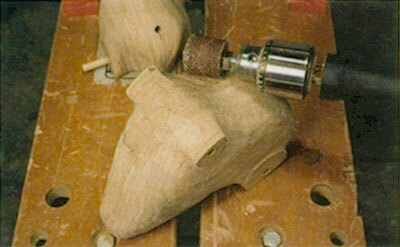 Finish smoothing the head and tail sections with grade 80 garnet paper - balsa wood blocks make useful sanding blocks. To all the wooden components apply two coats of matt Rustins acrylic varnish, rubbing down lightly between coats with grade 220 abrasive paper. 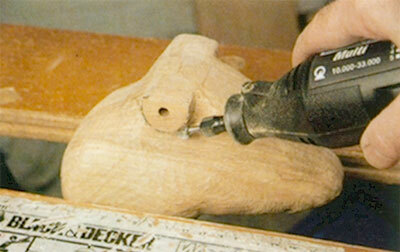 Drill the 6.5mm holes in the head for the eye dowels. Cut the steel rod to length for the ears, tow bar and wheel axles. 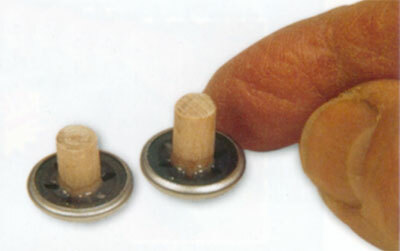 Note that the rod for the ears must be the right length to enable them to move freely when the spring caps have been fixed. Using epoxy resin, glue the wood ball for the tail onto the end of the spring cable, then cut the cable to length with a junior hacksaw. Also with epoxy resin, fix the exposed end of the steel body rod into the hole into the rear of the head section. 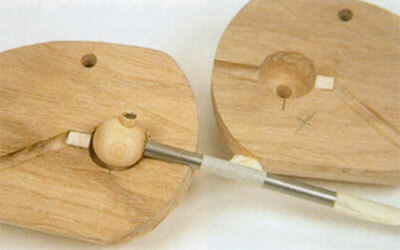 Note that the rod must be positioned so that it rotates equally in both directions. Mark its centre of movement and align it with the centre join in the wood, then resin one end only of the wheel axles into a wheel and leave to set. 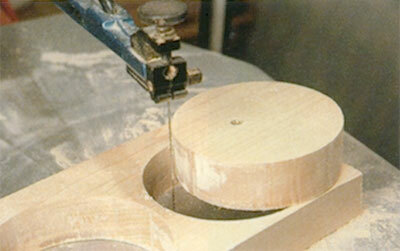 Cut two pieces of 6mm dowel to 10mm (3/8in) length and, using epoxy resin, fix one end of each dowel into a spring cap. When set, use epoxy resin to secure the spring caps into the eye holes in the head section. With epoxy resin secure the tail into its hole in the tail section and the tow bar rod into the hole in the head section. 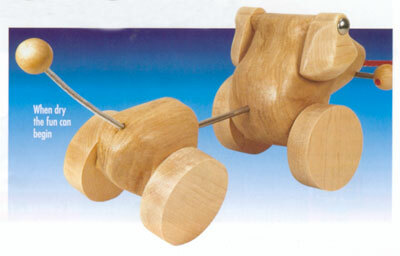 Place washers onto the wheel and axle assemblies and candle wax the axle rods, avoiding the areas which will be glued into the wheels before inserting them into the axle holes. Place another washer onto the axles before gluing on the remaining wheels with epoxy resin. Position the wheels so that their offset is opposite each other. Place a piece of gum strip tightly around the ends of the cotton cord to stop it unravelling, and when dry trim the ends through the tape with a sharp knife. Thread the ball with one hole onto the cord and then the other balls onto each end. Apply epoxy resin into the holes in the balls and press onto the ends of the tow bar, then squeeze the balls towards each other with a clamp until set. Use a sharp knife to trim the ends of the cord flush with the balls. Place a spring cap onto one end of the ear rod, insert the ear rod through an ear and then through the axle hole in the head section, and attach the other ear, making sure that they are the right way around. Add the other spring cap and get ready to take the dog for a walk. "This project is constructed from American oak and maple"